Prin Mayowa brings an array of journalism and public relations experience to her role as Junior Account Manager. Originally setting out with the intention of being a Surgeon, Prin attended Medical high school where she gained a background in Latin, biology, and mathematics. However, she drifted toward journalism and shifted her ambitions toward becoming a journalist. Having always been a storyteller, it felt like home. The pursuit of journalistic knowledge continued for some time until the world of public relations was opened up to her. Her in depth knowledge of both sides of the media allow her to fine tune a client’s idea or project before sending them out into the world. Since propelling forward into the world of public relations, Prin has been apart of the field’s most diverse teams. One of them being Blaze PR, a lifestyle firm, where she lead successful campaigns in for fitness and overall health & wellness clients. During her time at R+M: Reach the Masses, a creative agency, she was responsible for the complete overhaul of the public relations department while dabbling in the Social Marketing sector and aiding in a 50% following increase on their most important media channels. During Mayowa’s time with Brooklyn PR, she gained first hand client management experience, was responsible for increasing productivity by 15% and gained invaluable organization and business to business skills. Her diverse background makes her a integral part of SMG’s Public Relations team. Mayowa will now take all of her education and experience and devote it to the advancing the emerging cannabis industry while preserving the culture that defines it. 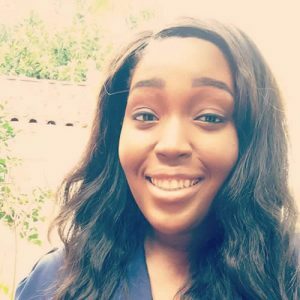 Mayowa is a recent graduate from California State University, Chico with a Bachelor’s Degree in Journalism & Public Relations with a double Minor in Marketing and Diversity Studies. She was awarded the prestigious A. H. Weibel & A.W. Bramwell Scholarship as well as The Orion Student Journalist Scholarship from the Journalism & Public Relations Program. While in school, Mayowa held the position of Assistant Account Coordinator at Tehama Group Communications. She volunteered for the yearly St. Jude Hospital Fundraiser, in Up Til Dawn, where she assisted the PR department. Prin also spent a year on The Orion, Chico State’s Student run Newspaper, as an opinion columnist, feature writer, and member of the PR team. Aside from her professional career, Prin takes her flair for writing to a personal place by way of her blog. She also dabbles in screenwriting, acting and graphic design.